The Backyard Inn i Rotorua, New Zealand: Reservér nu! Two weeks prior to arrival to cancel - 20% of total booking cost charged. Charged to guests credit card. Check in prior to 7pm. Contact reception on day of arrival to confirm final arrangements on 07 347 0931. Confirm if meals are required. 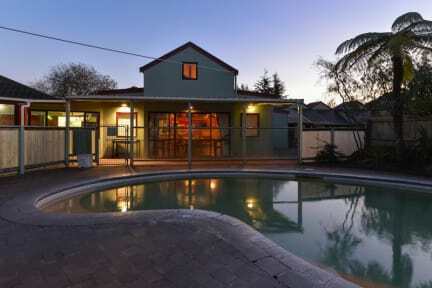 THE BACKYARD INN - Stay happy in the heart of Rotorua. It is our mission to make it easy for you to stay & play 'happy' in Rotorua's magnificent adventure wonderland. Your Backyard Inn hosts; The McLeay Family, have been passionate about delivering warm service to Rotorua visitors since the day it they put out the welcome mat in 1986. Conveniently set in four acres of green park-like grounds in Rotorua’s wondrous backyard, we’re flanked by awesome sporting and recreational amenities, including The Rotorua Aquatic Centre and Kuirau geothermal park. 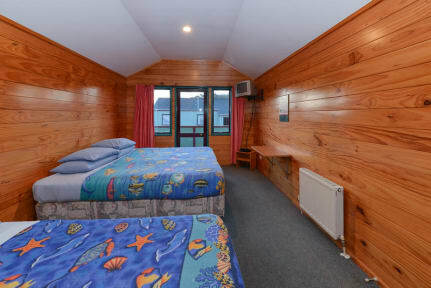 The Backyard Inn is an eclectic mix of dorm, camping and chalet-style accommodation. Its unique design makes it an ideal facility for travellers. Travelers can enjoy their own spaces in great value dorm options or camping sites. Guests may indulge in the thermal pool after a day of adventure. Enjoy great ‘real espresso’ in the Cocoon Café & Eatery and drinks and further meal options in the bar/restaurant. Or self-cater in a large, well-appointed communal kitchen. In the Heart of Rotorua. THE BACKYARD INN - on Kuirau Geothermal Park in the central city. Walk across the park into town, tours pick up from our door.